Tag line: "Capture the spirit of Christmas with this timeless classic!" One of the most endearing of all Christmas films, Miracle on 34th Street is as joyous and uplifting a motion picture as any the grand old Holiday ever inspired. 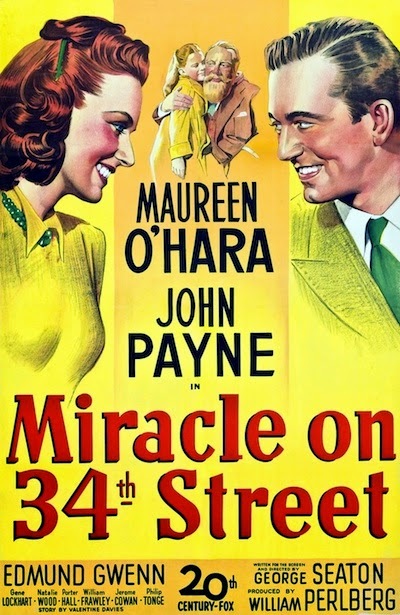 Doris Walker (Maureen O’Hara), an executive with Macy’s Department Store in New York, finds herself in a jam when the actor hired to play Santa in the Thanksgiving Day Parade shows up drunk. In dire need of a new Santa, she recruits a kindly old gentleman off the street (one who already has a white beard). Impressed with his performance during the parade, Mr. R.H. Macy himself (Harry Antrim) orders Doris to hire this “Santa” to act as the store’s official St. Nicholas for the upcoming Holiday season. And who is this actor, you might ask? Why, it’s none other than Kris Kringle (Edmund Gwenn), or at least that’s who he claims to be (according to his employment records, Kris lives in the North Pole and lists Dasher, Dancer, Prancer and the rest as his next of kin). Despite his perceived delusions of grandeur, Kris proves popular with the kiddies, including Doris’ daughter Susan (Natalie Wood) who, though initially skeptical, comes to believe Kris is, indeed, the real Santa Claus. Unfortunately, some adults have a different opinion of him. Mr. Sawyer (Porter Hall), an employee of Macy’s who, at Doris’ request, gives Kris a psychological evaluation, thinks he’s emotionally disturbed and a possible threat to others. Even Doris, who likes Kris, doesn’t believe him when he says he’s Santa. It isn’t long before poor Kris is dragged to Bellevue Hospital, where there’s talk of having him committed. In an effort to prevent this from happening, lawyer Fred Gailey (John Payne), a neighbor and close friend of Doris’, agrees to represent Kris in an upcoming hearing that will determine whether or not he’s mentally stable. In a surprise move, Gailey says that not only is Kris perfectly sane, he is, in fact, the one and only Santa Claus! But even if his claim is true, how exactly does Galey go about proving it? Edmund Gwenn is positively charming as Kris Kringle, a trait that shines through in some of the film’s best moments (aside from the opening parade scene, during which Kris angrily confronts the drunken Santa, there’s a later sequence where he teaches Susan how to use her imagination, convincing the young girl to prance around the apartment acting like a monkey). A kind soul who genuinely loves children, Kris Kringle is more than a character in a movie; he’s the embodiment of the Christmas spirit, displaying all the compassion and warmth that most people associate with the Holiday season (the scene where he speaks Dutch to a young girl who doesn’t understand English will melt your heart). By the end of the film, we want to believe Edmund Gwenn’s Kris really is who he claims to be. And that, my friends, is the true magic of Miracle on 34th Street: it makes believers of us all!